Exhibition Of Paintings By Salim Arif Quadri is an event that took place between 01-Dec-2006 and 21-Dec-2006 in Hyderabad. 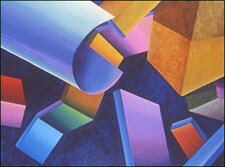 There are paintings of geometrical figures like circles, rectangles, triangles, cylinders and cones here. Well, at least it's different. Shrishti Art Gallery is organising an exhibition of paintings by Salim Arif Quadri, from 1st to 21st of December. Salim will be exhibiting his paintings under the title Geometry Without Gravity. As the name suggests, there are about 33 paintings of geometrical figures like circles, rectangles, triangles, squares, cylinders, cones, done on mixed media, with bright colors and hues. Salim is a Hyderabadi painter based in London. He has a Diploma in Fine Arts from the Birmingham College of Art, and a Master in Fine Arts from the Royal College of Art, London. This is his first exhibition outside UK. He has been part of various group workshops of art. Please contact the gallery at 2354-0023 for further details. Be the first to comment on Exhibition Of Paintings By Salim Arif Quadri! Just use the simple form below. fullhyd.com has 700,000+ monthly visits. Tell Hyderabad what you feel about Exhibition Of Paintings By Salim Arif Quadri!